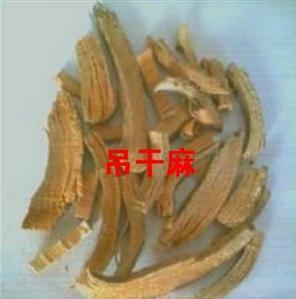 The drug is the dried root or bark of Celastrus anguslatus Maxim. (family Celastraceae), growing in waste hillsides or scrubs, and distributed in Southern China and Shaanxi, Gansu of China. Pungent, bitter, cool, slightly toxic; lung, liver and kidney meridians entered. Expel wind and eliminate dampness, activate blood, dredge meridians, remove toxicity and kill parasites. Tinea capitis, pustulosis, head louse, fracture, rheumatic arthritis, amenorrhea, pruritus vulvae, ulcers and sores.